The EuroLeague Finals are the championship finals of the EuroLeague competition. The EuroLeague is the highest level tier, and most important professional club basketball competition in Europe. For finals not played in a single game, an * precedes the score of the team playing at home. † 2001 was a transition year, with the best European teams split into two major leagues, (SuproLeague, held by FIBA Europe, and Euroleague, held by Euroleague Basketball). From 1958 to 1987, the Top Scorer of the EuroLeague Finals was noted, regardless of whether he played on the winning or losing team. However, there was no actual MVP award given. 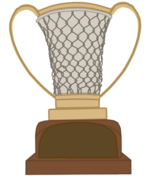 On the other hand, since the end of the 1987–88 season, when the first modern era EuroLeague Final Four was held, an MVP is named at the conclusion of each Final Four, at the end of the EuroLeague Final. (X) Denotes the number of times the player has been the Top Scorer, has won the MVP award, or the coach has won the championship. † The 2000–01 season was a transition year, with the best European teams splitting into two different major leagues: The SuproLeague, held by FIBA Europe, and the EuroLeague, held by Euroleague Basketball. ^ "European club champions: 1958-2011". Euroleague.net. 2007-05-02. Retrieved 2012-03-06.